Face Gua Sha is a unique and highly effective Chinese meridian therapy base on 2500 years of traditional Chinese medicine. Gua Sha Skillful stimulation of all the acupoints on the face energized by the combined application of highly effective herbal essential oils which further enhance the overall well being of all the major organs and systemic functions. 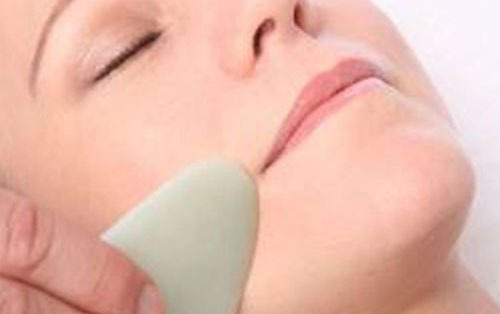 Regular face Gua sha will give you a radiance and glow from within. Get smooth and radiant skin before your night out. Your skin will cleansed, Gua Sha will be performed on your face and neck followed by moisturizing and sun protection suitable to your skin type. A customized cleansing facial which help detoxify the skin, as well as decrease dark eye circles and puffy eyes. It also provides a range of other health benefits, including reducing headaches, decreasing neck and shoulder tension, assisting sleep, and reducing stress. It's an excellent choice for brighter, radiant, and healthier skin. Includes exfoliation, extraction and mask application. Includes a hand, neck & shoulder massage.